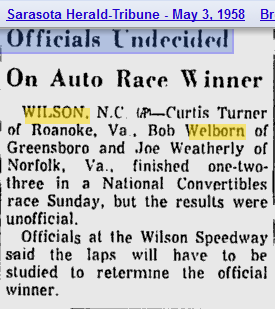 At Wilson Speedway in North Carolina on October 20, 1957, Billy Myers and Possum Jones raced to a controversial finish. In the end, Billy Myers in his #88 Petty Engineering Oldsmobile was declared the winner with Possum scored in second. 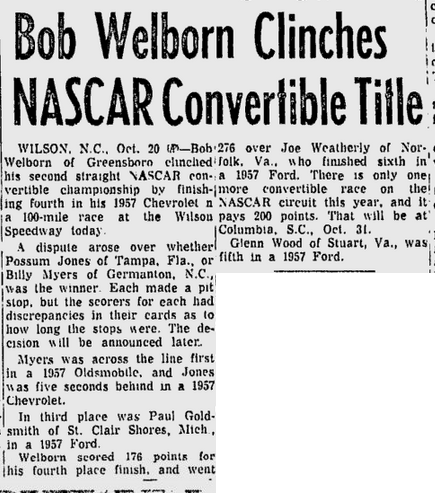 Bob Welborn's 4th place finish earned him enough points to secure the 1957 championship despite the convertible division having one race remaining in the season a week later at Columbia. Gwyn Staley started seventh and finished eighth in a Chevy convertible owned by Julian Petty (Lee's brother, Richard's uncle). I nearly missed out on posting about this race on its anniversary. Greg Fielden's book Rumblin' Ragtops and racing-reference.info both had the date of the race as October 30th. Fortunately, I found about the discrepancy this morning while looking for info to support Tim Leeming's October 20th post. Possum Jones was another of the good old fashioned nicknames we used to have in racing. About 4 years ago before I really got into blogging about Petty wins, I cobbled together a post of some of my favorite racer names - some nicknames and some given to them by their mamas. Possum topped my list.